NVIDIA has announced that its ray-tracing tech, only available on its new RTX cards so far, is coming to its older GeForce GTX 10-series cards in April. The technology will work on GPUs from the GTX 1060 and up, albeit with some serious caveats. Some games like Battlefield V will run adequately at low settings, but other games, like the freshly released Metro Exodus, will run at just 18 fps at 1440p — obviously an unplayable frame-rate. What games you’ll be able to play with ray-tracing tech (also known as DXR) on NVIDIA GTX cards depends entirely on how it’s implemented. In Battlefield V, for instance, the tech is only used for things like reflections. On top of that, you can dial down the strength of the effect so that it consumes less computing horsepower. Metro Exodus, on the other hand, uses ray tracing to create highly realistic “global illumination” effects, simulating lighting from the real world. It’s the first game that really showed the potential of RTX cards and actually generated some excitement about the tech. However, because it’s so computationally intensive, GTX cards (which don’t have the RTX tensor cores) will be effectively be too slow to run it. NVIDIA explained that when it was first developing the next-gen RTX tech, it found chips using Pascal tech would be “monster” sized and consume up to 650 watts. That’s because the older cards lack both the RT and tensor cores found on the RTX cards. They get particularly stuck on ray-tracing, running up to four times slower than the RTX cards on Metro Exodus. However, that falls to two times for Shadow of the Tomb Raider, and 1.6 times for Battlefield V, because both of those games use ray tracing less. The latest GTX 1660 and 1660 Ti GPUs don’t have RT or Tensor cores, but do share other architectural benefits with RTX cards — namely the ability to run floating-point and integer calculations simultaneously — will run ray-traced games moderately better than last-gen 10-series GPUs. None of this was much of an issue up until now, because there were really no games other than Battlefield V that took advantage of ray tracing. However, NVIDIA also announced that Unity and Unreal Engine, the two most-used gaming engines, now support ray-tracing. That means that developers can implement the tech by essentially just flipping it on, making it likely you’ll see it in more games soon. 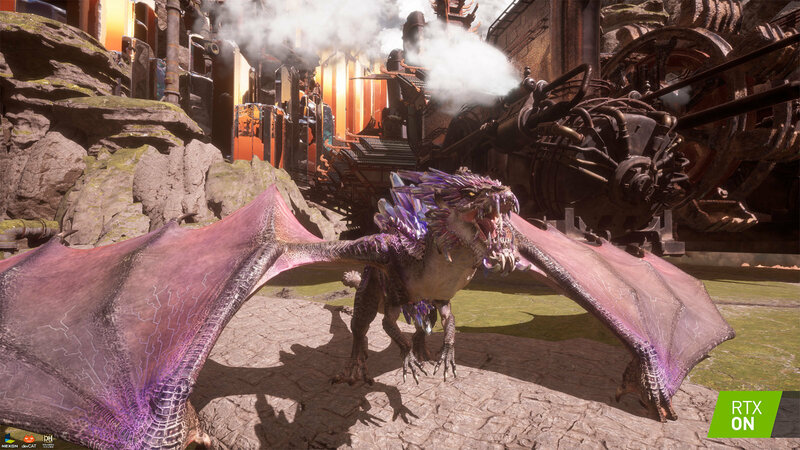 Finally, the company unveiled a few more ray-traced games and experiences, including Nexon’s Dragonhound (shown above), Quake II RTX and a brief demo of Remedy Entertainment’s Control. NVIDIA will show off all of those games at GDC, so we’ll try to get a closer look. It’s been a year since NVIDIA unveiled RTX GPUs, and the technology is off to a slow start, to say the least. Now that some games are arriving, NVIDIA is at least doing the right thing by unlocking the tech for buyers of older cards. Just keep your expectations low when NVIDIA releases RT drivers for GTX cards next month. Next ArticleHP Spectre 13 review (2018): Still the ultraportable king?